The Pharisees in today’s reading ask for a sign that Jesus’ healings are from God; Jesus replies that they have the sign of Jonah. We spent time with the Jonah story on December 20 and 21 and perhaps we better understand that the three days spent in the belly of the whale are an opportunity for conversion, the chance to thank God for the goodness we have received. Today we have the possibility of understanding the deeper meaning in Jesus’ words and actions, of more fully understanding that we have nothing to fear, of better understanding that our persecutors cannot touch what really matters – our souls. And we more fully see that God himself has overcome the evil of the world. The Pharisees try to trip Jesus up by challenging him on the details of the cumbersome Mosaic Law. When they realize that Jesus is too clever – and too grounded in God – to be caught in a trap of their design, they challenge his very authority. This is the beginning of their undoing. How does Jesus defend himself and what lesson can we take from his actions? Jesus does not waste words of explication but instead asks questions. What did David do? 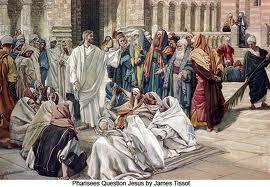 What do the Pharisees themselves do? We might follow this tactic and practice asking questions rather falling into the trap of arguing when we confront evil. How does Jesus reveal the fallacies in false charges? Rather than point out the hardness in the Pharisees’ hearts, Jesus describes what happens when people work against one another in a greedy struggle for control. Again he asks questions. By whom do your own people drive out demons? How will a kingdom stand when it is divided against itself? We might follow this strategy and develop our own skills of looking for the truth rather than focusing on proving others wrong. Jesus calls to his listeners using an image of trees bearing good fruit. Jesus teaches with his healing acts and leads by turning to God and allowing the Spirit to work through him. The crowds of people know where the evil lies . . . and it is not in the man who heals them even on the holiest day of the week; instead it lies in corrupt leadership, it lies in the collaborators who encourage the corruption to flourish, and it lies in the hearts on anyone who would rather sacrifice the kingdom in order to build a personal power base. We have so much to learn from Jesus. Teacher, we wish to see a sign from you . . . Are we members of this crowd? An evil and ungrateful generation seeks a sign, but no sign will be given it except for the sign of the prophet Jonah . . . Do we understand Jesus’ words that resurrection follows days of uncertainty and pain in the belly of the whale? When we see evil we know that we must confront it but we must do so wisely – as Jesus does – lest we empty our house of several small demons only to let in the monster Beelzebub to take up permanent residence in our hearts. Let us take a lesson from the master and decide that rather than argue with the devil, we will ask questions instead. Rather than point fallacies and errors to those around us, we will empty ourselves of our well-honed arguments and allow the Spirit to speak instead. And rather than throw ourselves against barricaded corruption and power in high places, we will turn to the God who knows and sees all, and give thanks to the God of all creation. In this way we bear fruit for the kingdom . . . and we ask God to confront evil. Tomorrow is Christmas Eve, the day when all creation gathers in anticipation of the One who fulfills God’s promise to us. So let us prepare to receive this most wonderful, most impossible, most loving gift. I agree. When we ask profound penetrating questions to an arguing person, we help him stretch his own understanding of his position. By doing so, we are not forcing him to accept our ideas through struggling debate; instead, we are helping him to gently convince himself in such a way that respects his own sense of intelligence.